Home is where my heart is, and that home is Kerala! The evergreen landscape, the effervescent waterbodies, the light blue skies, sun, lungi-clad men, gold shops, apartments, Beverages Corporation counters and queue, KSRTC buses, traffic, communism... There is always an element of interest, and a cliché. I don't see myself choosing Singapore or Seychelles over my homeplace for a long vacation anytime in the next few years. Anything more than 2 weeks and I'll be walking out of Arrivals in TIA. Lemme just fill in with some all-too-familiar random shots from my mob-cam during my short-hops during this vacation; one whole month in October, too short.. how time flies, particularly if you want it static. Can Mr.Hawkins and his time-travel theory help? Or rather the time-machine? 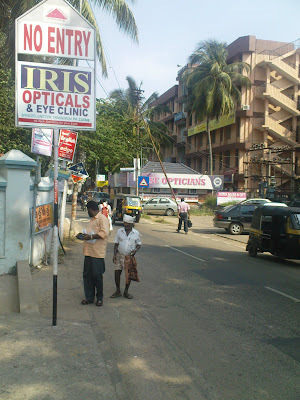 Pretty curious observation in Trivandrum this time. I saw this 'hump' signboard on several places mostly erected AFTER the hump. 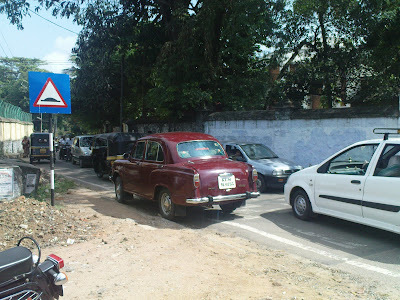 The law says (so do common-sense) that a traffic signboard should appear at a certain distance before the point.Whatever, here at General Hospital Jn you will see the signboard only after going over the hump. And a comedy of errors. The Statue Road has been a one-way street for decades, and still is (See the NO ENTRY sign). But the hump signboard is facing the wrong way and that too after the hump if you're from this side! A political presentation by BSP (yes, Mayavathi's elephant party) going on a busy road in Alappuzha. As usual a few jobless men wasting their time listening to it. It was a pleasure travelling through this newly built surface on the Alappuzha- Changanassery road, possibly the most scenic major road in Kerala. 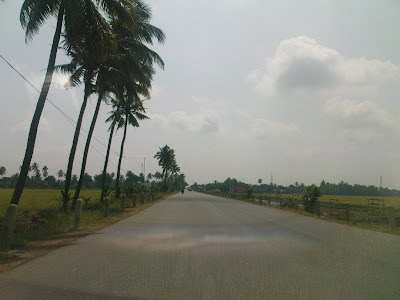 But such a wide state highway had no lane markings, no lights, no reflectors, no signboards, no nothing. That's some responsibility by the authorities given that this road has deep navigable water-bodies on either side for most stretches. The Venice of the East turning into a sewage farm. When K.C. 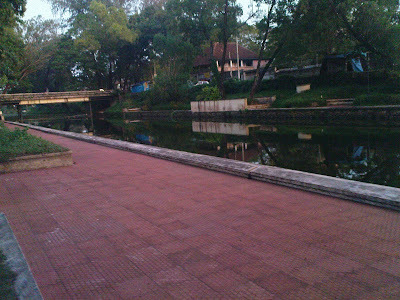 Venugopal was the Tourism Minister he ushered in a fresh breath of life to these canals in Alappuzha with parks, landscaped gardens and amenities. It seems we are back to square one. 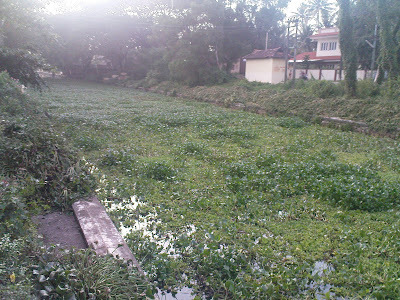 Cleaning work done for namesake, all the water-weeds deposited on either shores. Who is to blame? 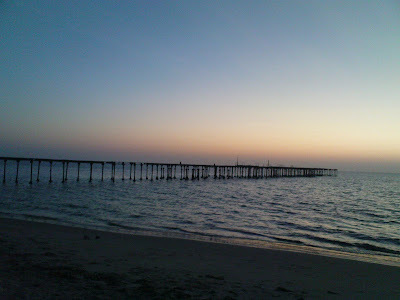 This one from Alappuzha Beach, monument to the wealthy proud tradition of the now dying town. 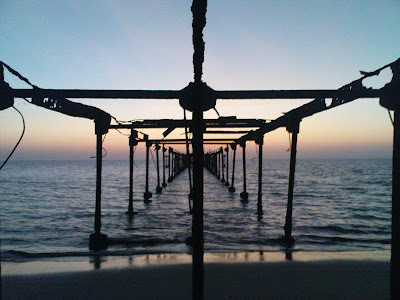 But the sea-bridge is dangerously corroded and unstable now but has anyone thought about dismantling the structure on the beach? Or are we waiting for it to crumble down on some innocent kid's head? 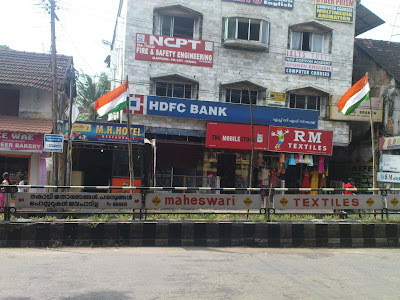 "Flagposts, advertisements, posters not allowed by order", says the warning on the road-divider. What Order, asks the politicos... Flagposts of INC galore...A scene from Alleppey Town. The city which never finishes construction. 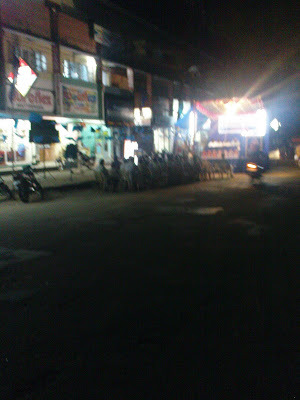 The roads in Trivandrum still mimic lunar surface. 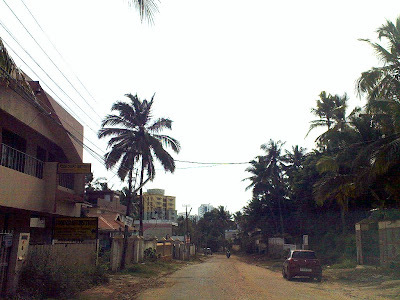 This is Pattom- Kowdiar road. Japan (JBIC Water Supply Project) ploughed through the center, laid water-pipes and left the scene, now the Capital road developers have invaded the two sides. Sigh.. But I shouldn't be complaining, these are sure signs of improvement in basic infra and these small difficulties will usher in a better tomorrow. 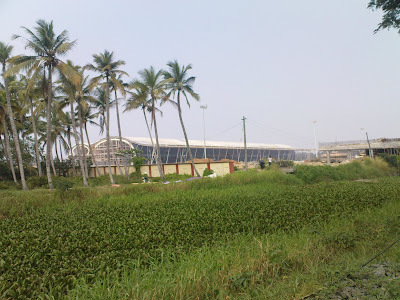 Something which gladdens my heart, the new Airport Terminal in Trivandrum will open in 3 months time, says who? Looks good doesn't it, don't mind the green-topped canal in the foreground... Hopefully I'll be using it next time I come home. 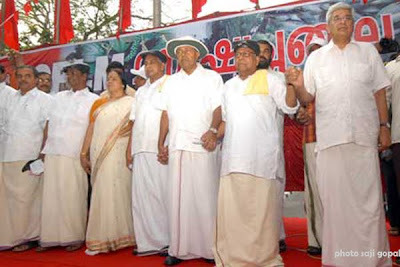 Nothing surprising for the common malayalee, all these are way of life for us. Excuse the photo quality of the shots, it's all taken with my humble mobile phone camera(except the last one) at the spur of the moment. 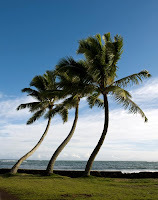 Thanks for visiting my site & good day to you all!